If you buy only one dressy dress this season, choose this one. It is elegant, versatile, and feminine, sophisticated and lovely. A round neckline tops a fitted bodice that hugs your curves, leading to an asymmetrical skirt reaching upper thigh length on the sides and dropping to a pint at about knee level off center in front and back. A hidden back zipper creates a custom like fit Long straight sleeves reach the wrist. Just add heels, pearls, and a clutch bag to complete the ensemble. 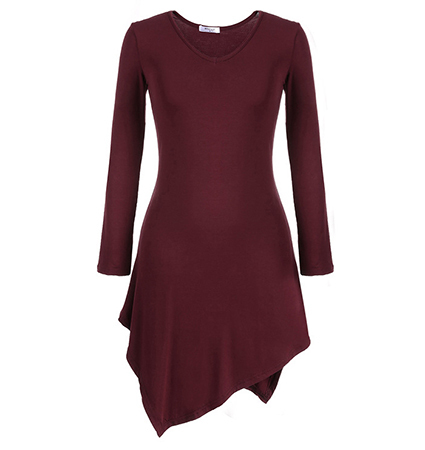 This fitted dressy dress is available in Breathtaking Burgundy, Classic Charcoal, Deepest Black, and Flirtatious Fuchsia.